My family went to the prison for the self-guided tour. It was on July 18th, 2011. The doors opened at 11am-4pm. We started our tour with a short film on the prison and its history. We loved the place and took all kinda of pix. We came home on the 19th and I downloaded my camera and on the 21th. We downloaded my daughter's blackberry. To our surprise, we found this pic. 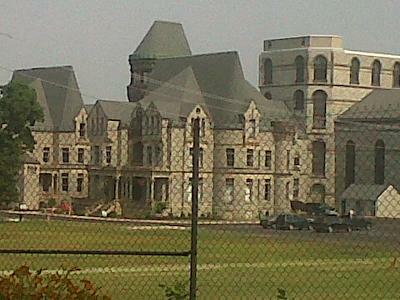 Ohio State Reformatory in Mansfield, Ohio is also known as Shawshank Prison. 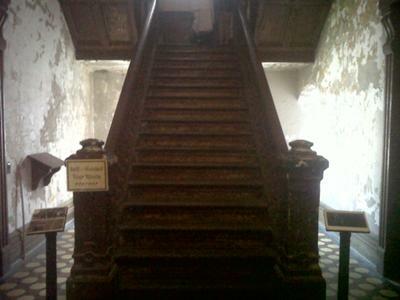 It is just a pic of the stairway, only the two at the top of the stairs weren't in the pix when she took it. You can plainly see the clothing is from the 30's to 50's, with one in white and one next to it in brown pants. This trip to the prison was much more than we expected. What a great place to explore! We heard whispering and some moans in the hole. And someone laughing at us on the back stairs. Overall, everyone should take the tour. We are going back to spend the night next season with an overnight stay.